UK homeowners can check how much they'd save with a solar roof. 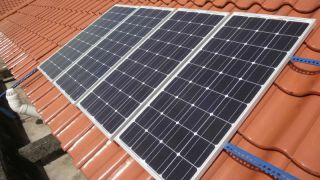 UK homeowners can now check how much money they would save by installing solar panels on their roofs. Google has just released a new tool, in collaboration with energy supplier Eon. It's called Project Sunroof, and it uses data from Google Earth and Google Maps to determine how much energy a house could save with solar panels. The premise is simple – by using data from these two platforms, as well as from weather data, it can calculate how much sun a roof is getting throughout the day, and use that data to come up with an estimate. The tool is not the first of its kind, though, with both Ikea and Tesla having similar ones already operational. However, these tools required homeowners to supply additional data, like the shape of their roofs, or their homes. Google says it can eliminate these steps with the help of Maps and Earth. Projoect Sunroof 'lowers the barriers' for homeowners, with the help of Maps and Earth, says Jonathan Marshall, head of analysis at the non-profit organisation Energy and Climate Intelligence Unit. "By analysing the roof shape, they will take out one of the steps that you would have to go through to get solar panels installed," Mr Marshall told the BBC. "The speed of the process means that if you're half-tempted by the idea, you're more likely to go ahead with it." Project Sunroof has been operational for three years now, in the US and Germany.